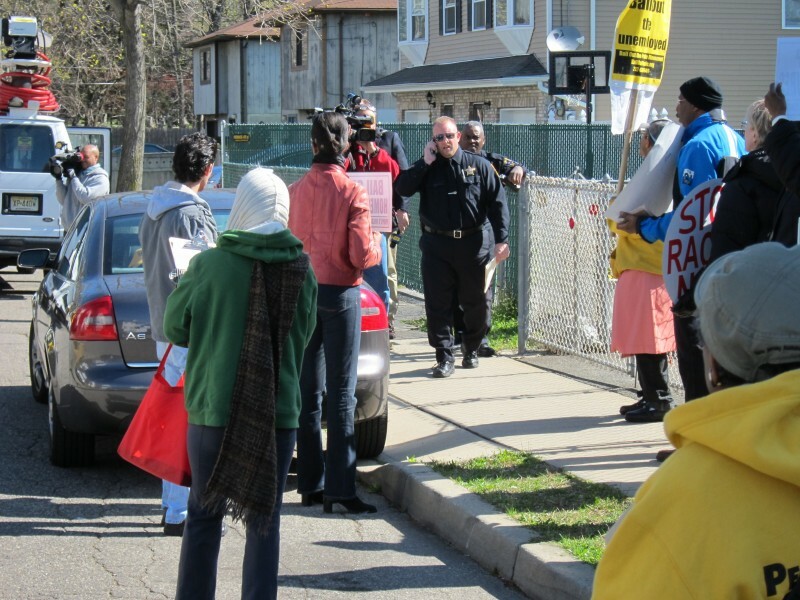 People power stops unjust eviction in Orange, NJ | Fight Back! 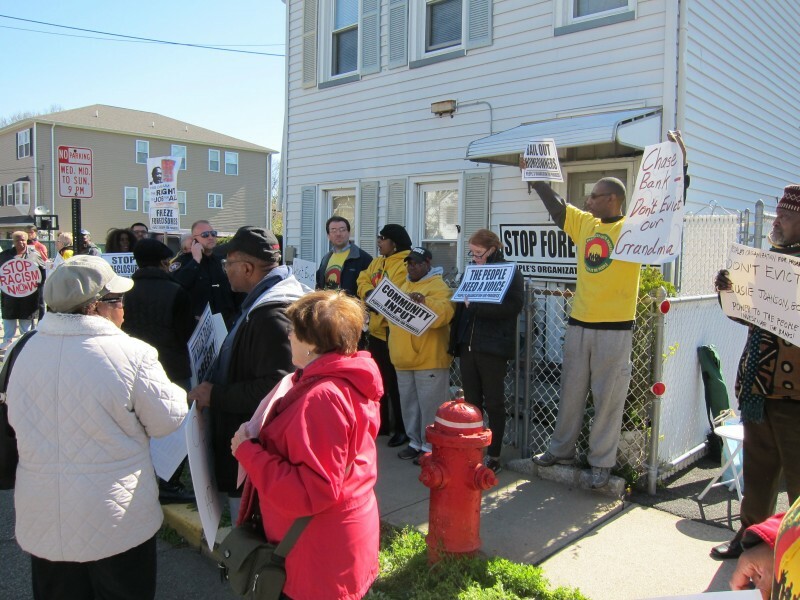 Orange, NJ - Over 30 people turned out, March 30, to protest the scheduled eviction of Susie Johnson, 77, from the home in which she has lived for 30 years. Their strong stand drew media coverage to the case. The eviction was not carried out today because the protest exposed injustice. A postponement until May 15 is in effect. The protest was called by the Coalition to Save Our Homes. The postponement is a people’s victory, but the struggle continues. The banks and the courts think they can ignore the rights of an elderly low-income African-American woman. Mrs. Johnson is represented by her daughter, Cynthia Johnson. Foreclosure was filed by Wells Fargo but the documents carry the names of several banks. JP Morgan Chase also wants an account number on the case. At this point it is not even clear what bank the Johnson family must deal with. The banks must be forced to clean their act up. The case has a long, messy history of abuses but the people’s forces don’t need a lot of details to act. We know banks have abused tens of millions of borrowers and gotten bailed out for trillions of dollars when their crazy, crooked schemes failed. We know it doesn’t matter what the banks do, prosecutors will look the other way. We have had it. This is a question of human rights. Our line is, “Don’t evict grandma, don’t evict Susie Johnson,” and that’s it. It’s like they’re looking for a way to pay ten bucks to avoid a business loss of twelve bucks. It’s not justice. It’s a fake. It’s official collusion. The people are the losers. We won’t stand for it. 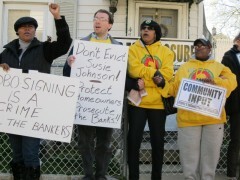 There are millions of Susie Johnsons who have had their human and economic rights violated by fraud and crimes by the banks. Her case shows the only way to get economic justice, or any other kind of justice for the 99%, is through the power of the people. People showed up at the March 30 protest for many reasons and from many organizations. There were victims of predatory lending who see the injustice to themselves in terms of a broad social issue. Women’s equality, human and civil rights organizations, organized labor, the Occupy movement, veteran activists and those newly come to struggle - all were represented. Lawrence Hamm of the People’s Organization for Progress called for a moratorium by the sheriff’s office on foreclosure evictions, as in Cook County, Illinois. He blamed the foreclosure epidemic exclusively on the banks and their predatory lending practices. Maretta Short of NOW-NJ told about the devastating impact on low-income women and children of trillions of dollars in human services budget cuts. Another person said college students now bear over a trillion dollars of educational debt. A student told of facing 179 months of payments for her education. Harry Perryman from nearby Irvington told how Irvington General Hospital was closed a few years ago. Now there is a plan to build a medical waste disposal plant there. “They close our hospital but give us the trash,” he said. There is strong community opposition to the proposed plant. Another speaker pointed out that all of these abuses stem from the same cause. Investment capital in the United States amounts to many, many trillions of dollars. There is so much capital that its ravenous appetite for profit swallows up the money for every human need. When the deputies from the sheriff’s office appeared they did not insist on proceeding with the eviction. Instead they called their supervisor for instructions. He came and asked Cynthia Johnson procedural questions about the courts. The outcome was the postponement of any action until May 15. The protesters cheered at the victory. Even the deputies seemed relieved. A Legal Services attorney who came to the protest agreed to help organize Susie Johnson’s case and assist with her defense. In the past she has not been able to afford to hire an attorney. The day showed the power of the people is a real force, not just a nice slogan. We must remain vigilant. There is no justice without people’s struggle.